Buffett puts on a good show. I have a really fabulous video I made with my phone. And by "fabulous" I mean "Horrid video of idiots (with me as the loudest) singing Son of a Son of A Sailor off-key and screaming". I am so proud of myself. It was a great show, but unfortunately afterwards it degenerated into a real "Besides that, Mrs. Lincoln, how did you like the play?" -type situation. No details to give, but suffice it to say that from 11:00 pm until 5:00 am was a real bummer. The only redeeming post-concert experiences were 1. 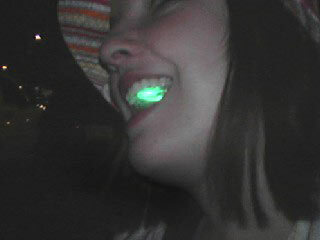 Blevins and I played with light sticks in the car (including one that fits in this mouthpiece. Ravers- is there anything they can't do?) and 2. The Waffle House hooked me up with a really excellent bacon and egg sandwich. Currently listening to: Sweet Child O' Mine, by Guns 'N Roses. Oh, lordy, look at Axl Rose....plastic surgery gone awry. Drs. Troy and Macnamara could fix that for him. Fiiiinnnssssss to the LEFFFTTTT. Glow Sticks are the shizzle!